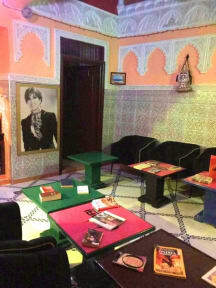 My first trip to Marrakech, so a little tricky to find initially. Staff is super helpful, gracious and polite. Upstairs terrace to relax and chill with a view of the city. Nice breakfast of eggs and breads with honey and jam, along with coffee or tea. Served in the downstairs communal area. Clean and neat. Beds are comfortable with nice heavy blankets. Steel lockers are available provided you have your own lock. Very close to the main square, restaurants, and shops. 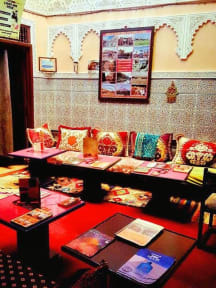 You can just book the hostel Riad Jennah Rouge directly, they are in the same company. The staff is so nice and they have a really awesome rooftop!!!! The best part in that hostel is the rooftop, it’s amazing , breakfast is good, the showers and bathrooms is clean, I really like the hostel . Our stay at this hostel was superb! The hostess Nermine was so great! As soon as we arrived she offered us tea and declious snack. On our last day there she made us an excellent vegetable dish. The place was only a 10-15 minute walk to the central market. I arrived around 6 pm to the hostel as a solo female traveller, yet the hostel was closed! The thing is I was not notified by the hostel or anyone else about it! It was very dark in a very narrow street. I mean I do not mind about being alone in the city but it was totally like a nightmare when I feel I am in the middle of nowhere and the place I will stay is closed! I rang the bell thousand times. No. Nothing. Then I rang the bell of another house closest to me. Someone opened and helped me. Hostel completly close! they don't tell us! we have arrived late in the evening and we have wait a long time to discover the reality.. thank you for the help of jenna rouge ryad and ryad dia to help us and find us a bed.